Unbeknownst to me, my boyfriend had been planning a surprise weekend trip to New York City for my birthday since February. I did not find out that our destination was NYC until the morning of my birthday, when he gave me a card featuring the Brooklyn bridge on the front and a boarding pass for a flight to NYC later that night inside! I was so surprised and touched! Traveling to NYC on a red-eye was likely the last thing he would normally want to do, but he knew I’d love it. I had the second half of the day off work, so I had enough time to pack. Before our flight that night, we went out for dinner at one of my favorite local places, Manhattan Beach Post. Our red-eye flight arrived in NYC around 8 am on Friday, Nov 2nd. We made our way into the city using public transport – the Long Island Railroad (LIRR) first, then the subway. We figured this would be faster and cheaper than using a ride-sharing service during rush hour. I still did not know what B had cooked up for us to do in NYC – he said I’d find out as we went along. We dropped our bags off at our hotel and headed out to the first surprise destination – Dominique Ansel’s bakery in the Financial district. You may not have heard of Dominique Ansel, but you have likely heard of his signature creation – croissant and donut’s love child, the Cronut! Not only did this bakery invent the Cronut but it’s also one of Conde Nast Traveler magazine’s top bakeries in the US. It is so popular that even my mom in Bulgaria had heard about it. ALL the goodies in the bakery. Its other signature pastry, the DKA, is in the bottom right corner. The bakery lets you put in your order in advance and select a day and time to pick it up, which is what B had done. This saved us valuable time as we had to rush to our next destination. We ate our cronuts in our Uber as we approached the new One World Trade Center tower. The last time I had visited NYC, in 2012, the 9/11 memorial was open but the new tower was still being built. It opened in 2015 and its top-floor observatory quickly became a popular tourist spot. B had booked us the Mastercard VIP experience. This included priority for the security line and the elevator, both of which could get pretty backed up. The elevator ride to the 100th floor was pretty unique. As you go up, a video screen on all 4 sides of the elevator shows a hyperlapse of New York City’s development from the 17th century until today. You will see the twin towers, built in 1970, pop up towards the end of the video. Once at the observation deck, another video provided a surprise twist at the end. Watch! Our tour guide walked us through the entire observation deck, stopping every so often to explain to us what we are looking at. Even though I’ve been to NYC before and was familiar with its major landmarks, I still thought the narrative helped us enjoy the views all the more, and I learned a bunch of new things. One of the facts that stuck with me was the height of the tower. It’s 1776 ft tall, the number paying homage to the year the Declaration of Independence was signed and the United States were born. Looking East. Battery Park is visible at the end of Manhattan between the tall buildings. Governor’s island , open May 1 – Oct 31, is behind that. Further back you can see the Verrazzano bridge, which just had its second “z” restored – it had been spelled Verrazano for more than 50 years due to a misspelling in the original contract. The collection of tall buildings in the upper left is a new large-scale development called Hudson Yards. Moving to the right, you should be able to make out the Chrysler building with its spire. In the lower right corner of this picture is TriBeCa, which I learned stands for “TRIangle BElow CAnal street.” Similary, SoHo stands for SOuth of HOuston (which, by the way, is pronounced “How-ston” not “Hue-ston”). The two bridges from left to right are the Manhattan bridge and the Brooklyn bridge. Chrysler building in the upper left corner. The jenga-looking building in the lower right is actually called the Jenga building. It seems out of place because large swaths of this area are deemed historic neighborhoods, hence fewer skyscrapers. Apparently, this tract was one of the few not protected, and that’s how this skyscraper snuck in. Despite the cloudy day, the views were gorgeous, as you can see from the photos. Even though it was a weekday, the place was especially busy due to all the marathoners in town – the NYC marathon was scheduled for that Sunday. Once the tour was over, I found out we had lunch reservations at the restaurant on the observation deck. We were still pretty full from the cronuts we had inhaled a couple of hours ago, but we enjoyed some drinks and light fare at the restaurant. Since we got there right as it opened, we got a table with a pretty sweet view. Birthday weekend off to such an amazing start! On our way out, we went through the Oculus – the structure that houses the One World Trade Center transportation hub. The building, by Spanish architect Santiago Calatrava, is designed to bring light into the underground rail station and 78,000 sq ft of shopping space. We also paid visit to the 9/11 memorial. 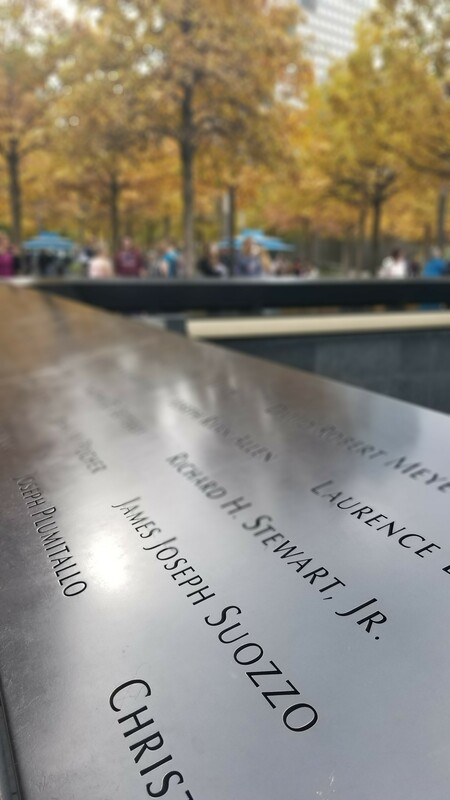 The sites of the twin towers have been turned into pools and the names of those who perished are inscribed into the parapets. By the time we headed to the hotel, it was mid-afternoon and we were ready to take a nap! As convenient as red-eye flights are, they can be draining! B had booked us a nice room at the Intercontinental in Times Square. We had a high floor, and I loved the view from our two picture windows. I can’t decide if I like the daytime or night-time view better! By the time dinner arrived, I knew B had picked someplace special. 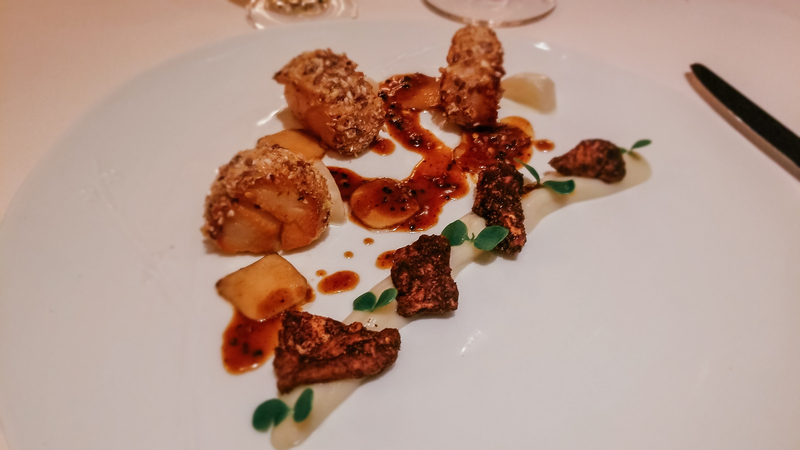 I thought hard about where he could be taking me for dinner, and the only place I could think of was Daniel, renowned French chef Daniel Boulud’s flagship restaurant. 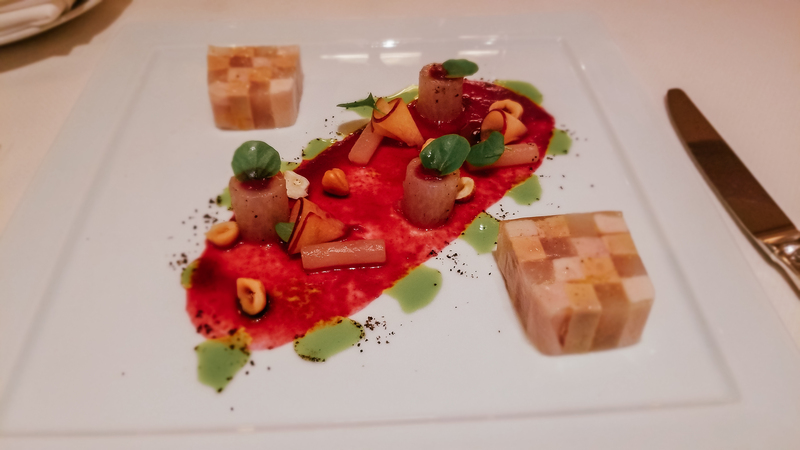 I had seen Chef Boulud in October 2013 in Santa Monica when he was interviewed by the famous LA Times food critic Jonathan Gold. I have this grainy cell phone photo from back then – cell phone cameras were not what they are today! Chef Boulud came to mind again last Christmas. We were in Miami, FL. 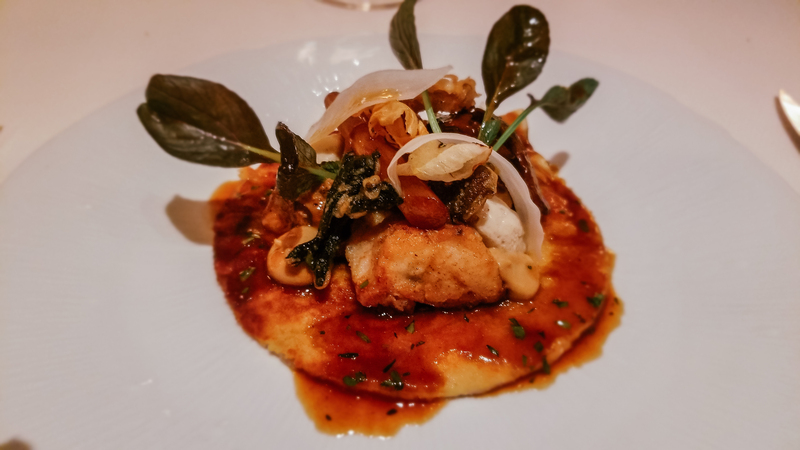 On our way back from Vizcaya Museum and Gardens, we drove by the brand new addition to his impressive list of restaurants, Boulud Sud Miami, which opened only a few days after we were there. 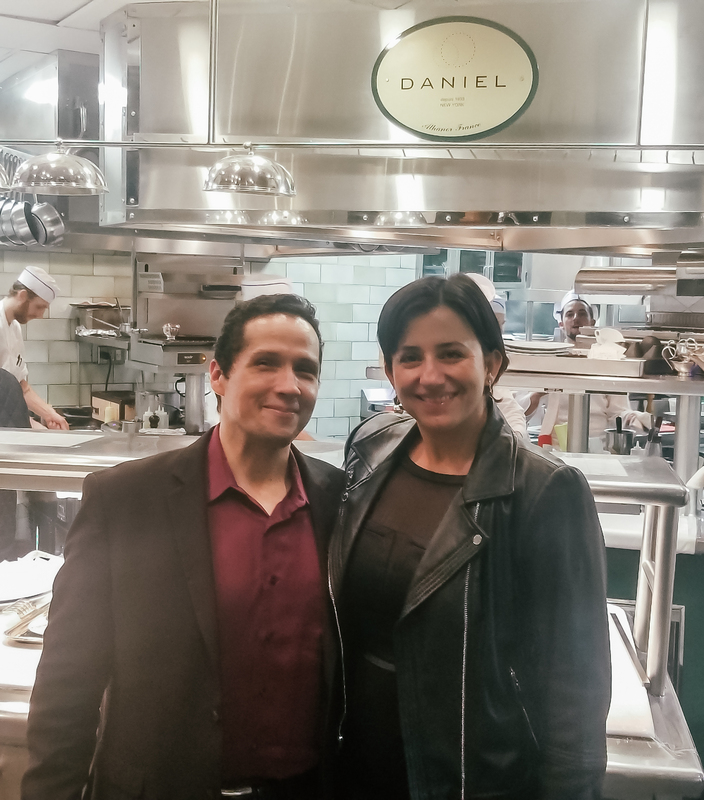 Boulud opened Daniel in NYC in 1993. The restaurant moved to its current location, a Venetian-inspired building on the Upper East side, in 1998. 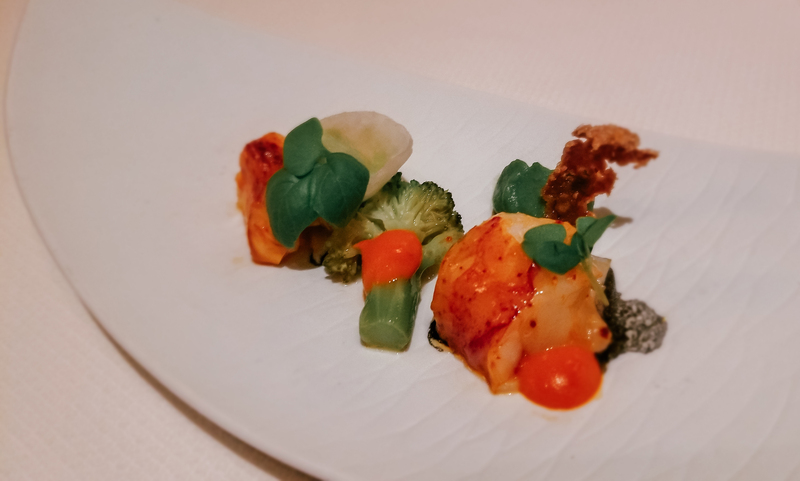 The restaurant has been consistently awarded two Michelin stars by the famous French hotel and restaurant guide, and was even awarded its highest honor, a third star, in 2010. B wouldn’t confirm whether my guess was right or not, so it wasn’t until we walked up to Daniel’s front door at Park Ave and 65th St that I knew for sure. The next few hours were a complete delight in every way. 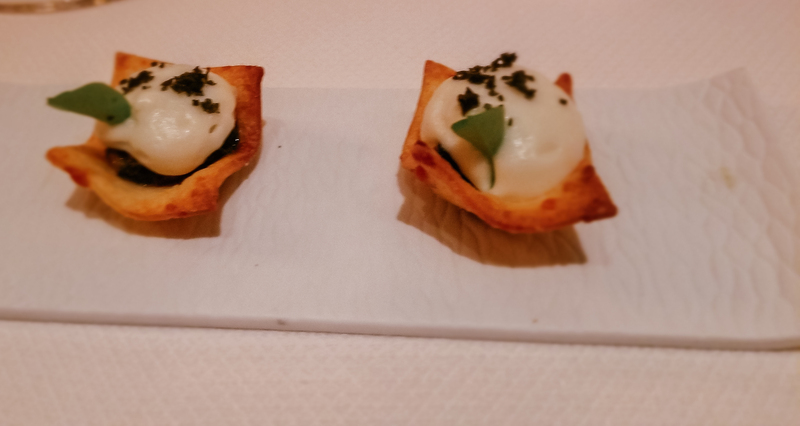 We chose the seven-course prix-fixe menu and picked our own cocktails. I opted for the pisco sour, while B opted for Moonlight in Vermont – Whistle Pig whiskey smoked in Vermont Oak and prepared tableside. The oak plank is heated with a torch, then the glass is placed upside down on the plank to absorb the smoke. All seven courses were to-die-for. 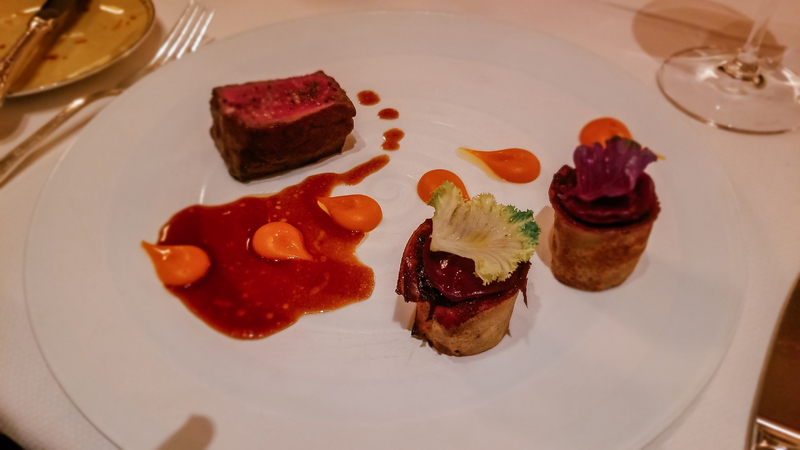 We had veal, wagyu, lobster, scallops, foie gras… It was hands down the best meal of my life. The service was impeccable and we loved our table in the corner overlooking the rest of the dining room. And the desserts… they just kept coming! Two came with our prix-fixe menu, one was a special birthday dessert, and we also received some chocolates to take home together with a printed card wishing me Happy Birthday and listing everything we both had to eat. They did a great job making this a meal to remember! The icing on the cake came after dinner. We found out from the staff that Daniel Boulud was in the restaurant that evening, and we asked if we could talk to him. He did come out into the dining room and greeted some of the guests, but he never made it to our corner. We were a little disappointed, but then the staff told us he can meet us in the kitchen in a little bit! Next thing we know, we were right smack in the middle of the kitchen, watching the magic happen. 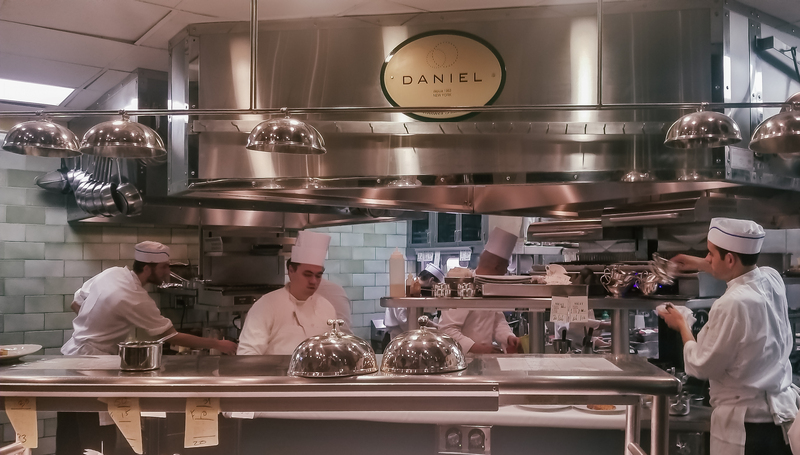 The Chef’s table at Daniel. 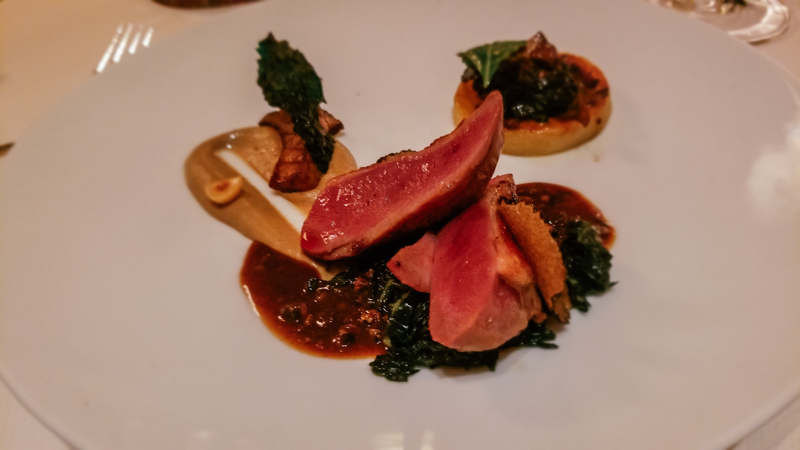 A chef’s table, typically located in the kitchen of a restaurant, is where the head chef cooks and serves special dishes and menus to friends and VIPs. 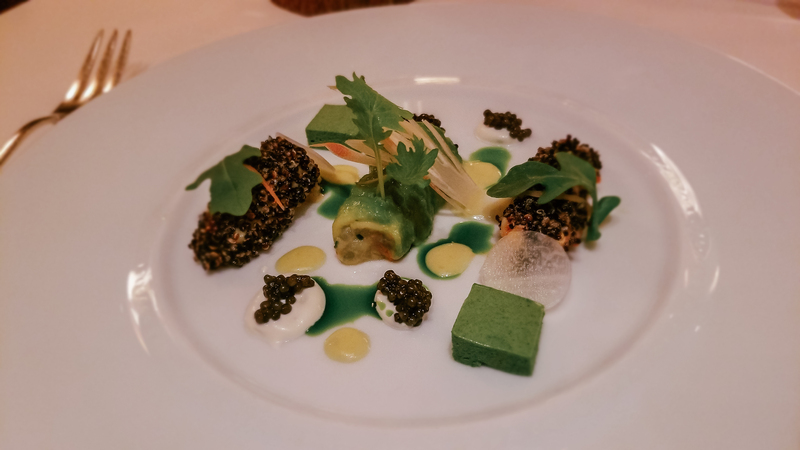 It must be such a special treat to have a meal at chef Boulud’s table! As we were standing there, chef Boulud and his chef’s table guests walked by us on their way out. We promptly followed and patiently waited in the bar area of the restaurant while he said his good-byes. When they finally left, he came by and chatted with us for a little while too. He was amused that I’d seen him five years ago in LA. He was so gracious and nice! Not only was he spending his Saturday night at this restaurant, but he was so approachable and genuine. What an amazing first day in NYC! It is so good to return and make new memories here with B! Deb, that was just day 1! We spent two more days and one of those was marathon day. We could only watch for a few minutes, and the Leggers I knew weren’t at the spot I was at yet.